Welcome Spring with a relaxing outdoor lunch, and include tasty Bacon wrapped Corn On The Cob to make it unforgettable! The best way of eating corn is by far On the Cob. Delicious as it is, you can cook it in many different ways: boil , steam , roast and of course BBQ – my favorite way. 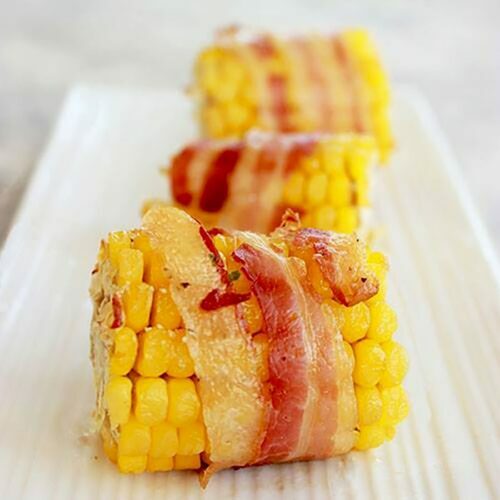 These tasty bacon wrapped corn on the cob are very quick and easy to prepare, and never fail to make guests happy around the table. Each corn is cut in 3 chunks, making this recipe perfect to serve as appetizer or side, or even as finger food at parties. All you need is fresh corn and smoked bacon strips, which add a fantastic meaty flavor. Fresh corn is at its best when it is very milky inside, and it should be quickly boiled and not left to sit in the boiling water very long. After a quick boil, simply wrap a bacon strip around each chunk of corn and grill for 5 mins, until the bacon is crisp and golden-brown. There are different grilling options you can follow: BBQ is always the best choice, or you’re planning a picnic, you can use this cool portable bbq I discovered a while ago; oven is of course the easiest option, just turn the grill setting on and you’re good to go. 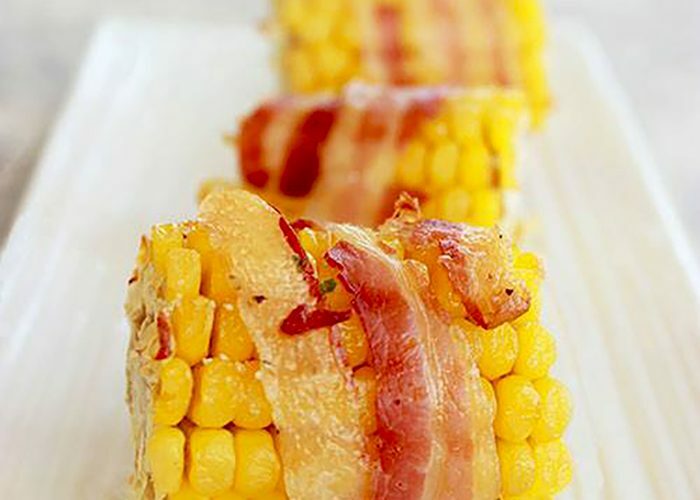 Simple and easy, these yummy bacon wrapped corn are ready in less than 15 min, and they promise to be the star of your next BBQ! Hungry for more? Check more tasty Spring recipes! Cut each corn into 3 large chunks. Fold them into the pan and bring the water back to a boil on high heat (covered or not). It will take approximately 3 to 4 minutes to bring the water back to a boil. Once water comes back to a boil, cook for 2 more mins, then remove the corn chunks from the water. Pat the corn dry and season a little, and wrap a bacon strip around each one. If needed, secure the bacon to the corn with a toothpick. Transfer the corn on baking tray covered with foil. Grill in a preheated oven on grill setting at 400F/200C for abut 5 mins, or until bacon is crisp and golden-brown. That’s great! What are you waiting for, make it straight away :D!